"The 1687 Reihō Temple Ordinance"
Dated Jōkyō 4, 6th Month (1687). Source: Reprinted in Nakatsuka 1979, pp. 395. 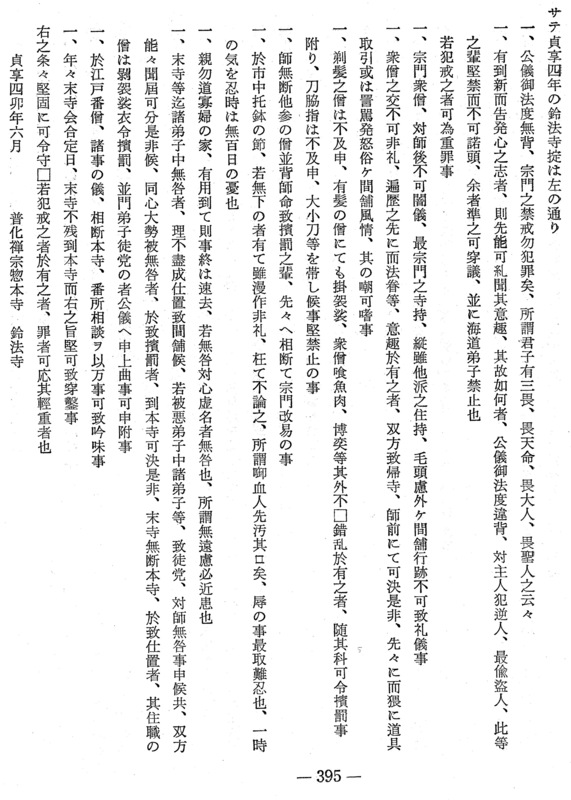 Do note that in this reprint version of the document presented in the Nakatuka Chikuzen 1979 publication, at the very end of the text the document is somewhat obscurely signed Fuke Zen-shū sō hon-ji, 普化禅宗惣本寺 鈴法寺, "Fuke Zen Sect + all + head temple(s) + Reihō-ji". Noteworthily though, neither is the shakuhachi itself nor the practice of religious begging, takuhatsu, mentioned in the document at all. in Nakatsuka 1979, pp. 395-396.